A zip and link mattress system will create a large bed, usually 6ft super king size. The advantage of this is that each partner has a bigger sleeping space than a normal double or king size mattress, making for a much more restful and undisturbed night. The other major advantage in buying two 3 foot single mattresses and zipping them together is if both partners have different firmness requirements. It may be that you sleep better in a soft mattress but your partner sleeps better in a firmer mattress. You can then purchase two different mattresses with different firmness for the same bed. If you and your partner are of a different stature including height and weight then again you may require different mattresses to give you both a supportive and comfortable night`s sleep. If the bed is also made in two parts and zipped together it will also allow you to make the double bed into two single beds if you need them. This could be the case if one person is ill and needs complete rest without being disturbed by the other partner getting in and out of bed. It has also been the case as couples get older they sometimes want to change to single beds. By having zipped and linked beds this can be achieved without the expense of having to change the bed for new ones. When zipped together the two mattresses act as one and you do not feel any join down the middle. A zip and link Mattress also has the advantage in making it easier to carry it up to a bedroom especially if the staircase is very narrow. When considering buying a zip link mattress and bed you should consider all these factors as they could determine what type of mattress you and your partner require to provide you with the quality of sleep you both need. The Bray is a 1500 Pocket Sprung orthopaedic mattress which is 10 inches (25cm) deep and features a .. The Harrison Pocket 6700 mattress is handmade using the finest natural fillings combined with double.. The Harrison Pocket 8700 mattress is handmade using the finest natural fillings combined with double.. 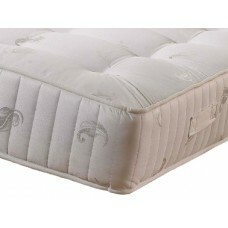 The Harrison Pocket 10700 mattress is handmade using the finest natural fillings combined with doubl..